Apple devices are simply terrific with performance, no doubt remains about it. At the same time it is also a fact that you have to drain same amount of sweat whenever a flaw appear with these super devices. iTunes error 3194 is not an unknown problem at all for the Cupertino fans. The biggest challenge about it is that it can simply baffle you through your process. In fact it is pretty difficult for the beginners to deal with problems of this kind through support page. There has been claims regarding the upgrade of Cupertino devices, and we agree with it up to many extents as well. You have to struggle a bit while going for upgrade, no doubt is there on this regard. It’s like quite mandatory to come across with issues during this time. Anyway, let’s focus on this particular aspect. 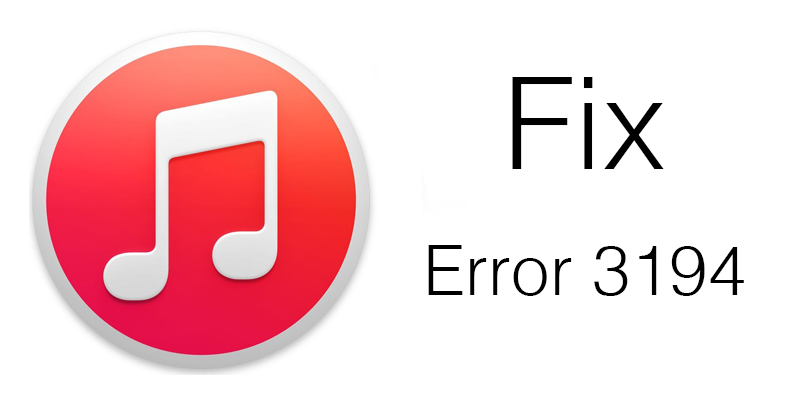 If you are dealing with the iTunes Error 3194, then you must try through the approach given below to fix iTunes error 3194. It has been tried practically, and works. Check it out! Problem never comes with a prior notice. With web platform they are simply unimaginable. There are many probable reasons possible for the particular issue. It might be a reason of the Anti-virus installed over your PC as well causing the problem. Hence, you should try once disabling the anti-virus. Try out your approach after going for a restart. On this context, it is always advisable to go with the appropriate antivirus. Go with the protective tool that suits your device way. Firewall preventing specific files can be another reason as well. This sort of block prevents some files getting accessed. For the error 3194 in iTunes, disabling the firewall sometimes work well. In other words, you may go for allowing iTunes through firewall. Yes, you have to restore the process from the beginning after this. Connectivity can also be the probable reason behind this sort of error. Normally the VPN settings in public places like offices don’t let links through validation server. It is important on these occasions for the iPhone users looking to upgrade are that they opt for a destination without any proxy setting. The above explained ways are the basic approaches you should try to resolve iTunes error 3194. Still, if the problem is too stubborn, then the steps mentioned below can work well for you. #2: Still the iTunes 3194 Error not fixed? Not only the Cupertino devices, but products irrespective of manufacturer don’t like to see the expired editions with a device. Using the same concept, your problem with iTunes might be the result of obsolete iTunes applications you are considering. These outdated tools bring issues along the iTunes. Actually, problem in these cases appear as your device just don’t manage to link with server through DNS. You can overtake these issues going through the steps given below. First, remove your device from the desktop post appearance of the errors. Now terminate the iTunes application. Make sure you are dealing with your PCs being an admin. 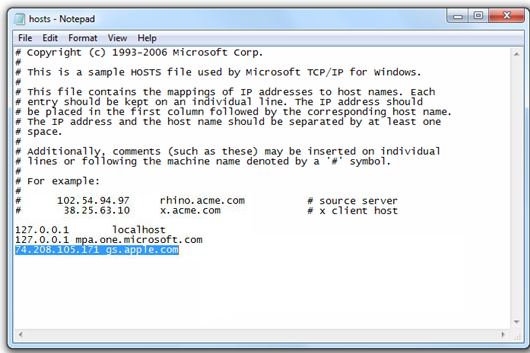 Now open the hosts file through any document editor. Now select the 74.208.105.171 gs.apple.com line, and remove it. Next step is to connect your iDevice with the PCs again and initiate the iTunes application. Finally, time comes to upgrade / restore your iPhone, iPad, or iPod through the iTunes application. If you have followed the above mentioned steps perfectly, then it’s quite sure that there will be no more appearance of iTunes error 3194. In case your iTunes application is not working at all, make sure this is the reason of the presence of some bugs. Don’t worry; you can still upgrade/restore your iOS device following the steps given below. You have to take the help of TinyUmbrella on these occasions. Anyway, make sure your iDevice is attuned with the TinyUmbrealla application. Close the iTunes application if it is still opened. Then, download the TinyUmbrella application for Win/Mac from our download section. Upon having the admin access over your system you can now open the TinyUmbrella and pick your particular device. Now go for Advance tab, and unmark the “set hosts to Cydia on exit”. Next, save the settings and implement the alterations. If you have performed the steps mentioned above exactly the way it has been mentioned, then it’s quite sure to stay away of iTunes error 3194. Still, if any problem persists you just feel free to complain.